Where others see discards destined for the compost bin, San Francisco Chronicle food writer Tara Duggan sees potential culinary gems destined for her dinner table. She is no zealot, despite practicing what her husband has nicknamed "compost cookery," but she has been known to rescue broccoli bits from the family kitchen's green bin. "Broccoli leaves are delicious and have this silky quality, and broccoli stalks, stripped of their fibrous outer layer, are the sweetest part of the vegetable," says Duggan. "When we're not eating the whole vegetable we're missing out on all these flavors and textures." Clearly, Duggan delights in getting the most out of her vegetables. 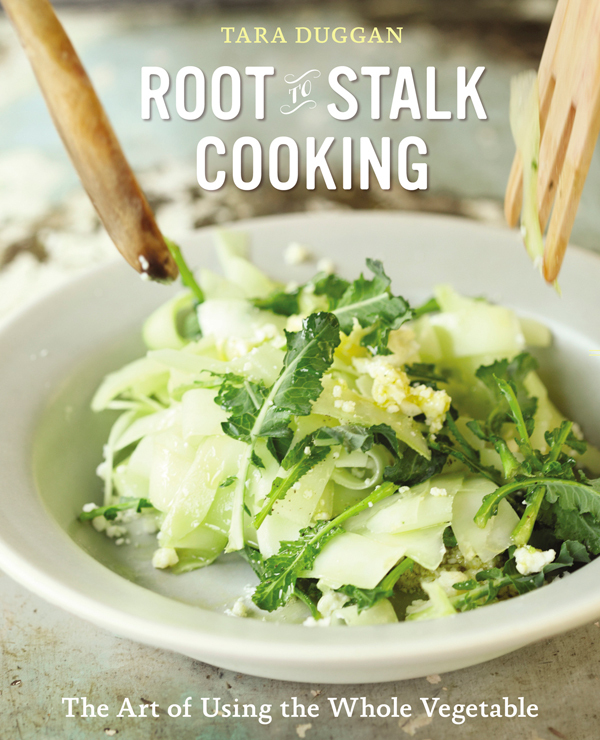 And she shares her tips, tricks, and recipes in her latest cookbook, Root to Stalk Cooking: The Art of Using the Whole Vegetable, which celebrates carrot tops, fennel fronds, leek greens, and other so-called vegetable scraps often overlooked by home cooks. Hot on the heels of the nose-to-tail butchery and cookery trend, veg-centric cookbooks seem to be giving meat-focused recipe collections a run for their money right now. Witness recent tomes on the pleasures of produce by culinary heavy hitters such as Nigel Slater (Tender and Ripe), Yotam Ottolenghi (Plenty and Jerusalem), Deborah Madison (Vegetable Literacy) and Hugh Fearnley-Whittingstall (River Cottage Veg). After a period where animal cookery seemed to rule, chefs are continuing to turn their attention to the plant kingdom and finding as much inspiration and innovation in vegetable "offal" as a slab of meat. Duggan was ahead of the curve. The James Beard award-winning writer and San Francisco California Culinary Academy graduate first wrote about root to stalk cooking in a story for the Chronicle in 2009, when she discovered that Bay Area restaurant chefs were not just using Swiss chard stems and turnip greens, they were bragging about it too. Since then she's seen local chefs step up their scrap artistry and home cooks becoming increasingly curious about using the whole vegetables they find at farmers' markets, in CSA boxes, or in their own backyards. It turns out, there are multiple reasons to eat more of our vegetables. Thrift, for one, of both the economic and ecological kind. Since Duggan spends time and has written about her brother and sister-in-law's off-the-grid Windy Hollow Farm, she is acutely aware of the energy and labor that goes into growing produce in the first place. "If we use carrot tops as an herb rather than buy a bunch of parsley, or cook beet greens rather that pick up a bunch of chard, that's one less plant that has to be watered, fertilized, harvested, transported, and refrigerated, not to mention one less thing to buy," she notes. And Duggan abhors food waste, a widespread problem in professional and domestic kitchens. In her book Duggan quotes from a three-decade study conducted by the Garbage Project at the University of Arizona, that found American households throw out 25 percent of their groceries overall. But her underlying motivation for writing Root to Stalk Cooking: Finding more flavor from the foods we know. "Finely chopped carrot tops in a salsa verde add just the right hint of bitterness," says Duggan. "Beet greens have a very subtle flavor, different from the actual beet, so using the greens can elevate a dish and give a cook more depths of layers to work with." Duggan, 42, who lives in San Francisco's Glen Park neighborhood with her husband and two daughters, had some new edible adventures of her own recipe testing for her book. "Before I researched the book I thought leek greens were inedible. Every recipe you read calls for cutting off leek greens and discarding them," she says. "But it turns out they make a nice braising green with an onion flavor and a silky texture." And she had her share of flops: Duggan had little luck turning corn silk into something edible and her experiments with basil stem oil only resulted in a product that was grassy and bitter. She gives nods to local chefs who play with produce odds and ends in toothsome ways, some of which found their way into the pages of her book. "Chris Cosentino of Incanto in San Francisco is known for his nose-to-tail cooking of animals, in particular his artful use of offal," she says, "but he applies that same sensibility and respect to the produce that comes into his restaurant in dishes." Cosentino uses fennel fronds, stems and cores, for instance, in a risotto that also makes the most of boiled Meyer lemon rind. At the Chinese restaurant Eric's in Noe Valley, chef-owner Tony Sung has long used the dark green parts of leeks in a pork belly dish. Chef Sharon Ardiana, of Duggan's neighborhood pizzeria Gialina, shares her Kale and Farro Salad with Avocado that uses whole kale leaves, including the stems. This writer can attest to that salad's deliciousness.) And Duggan credits Chez Panisse Vegetables as the place where she first learned to cook with Swiss chard stems in a gratin she dubs delicious. "I think the recent ramped up interest in vegetable cookery is because we're just starting to see the potential for flavor in vegetables and that there's a whole universe of unique flavors we haven't taken advantage of until now," says Duggan, who has a couple of new veggie cookbook favorites of her own. She enjoys the recipes found in Joe Yonan's Eat Your Vegetables because they're "immediate, fun, and accessible." She also likes Diane Morgan's Roots, for its fresh approach to showcasing what Duggan calls the wallflowers of the vegetable world. 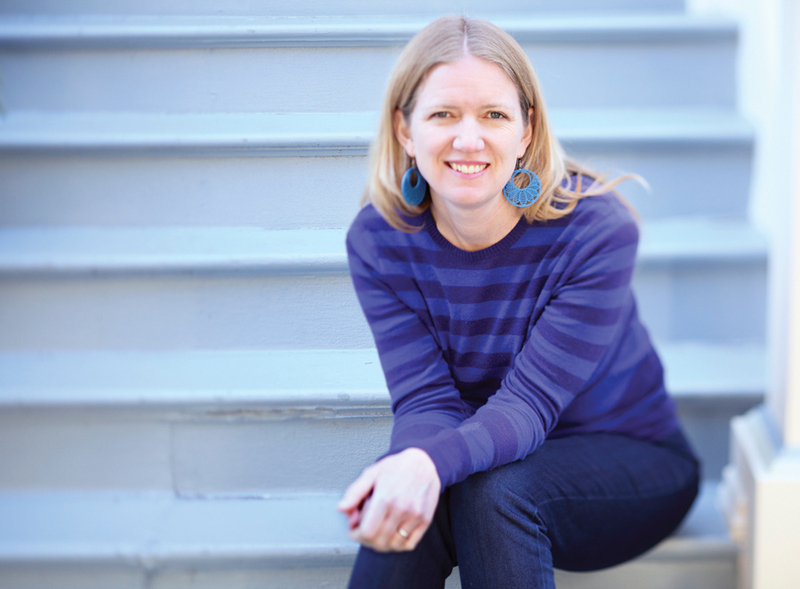 Duggan, who describes herself as a generalist, has written previous cookbooks, including The Blue Bottle Craft of Coffee, Waffles, and The Working Cook. For now, though, she's planting herself firmly on the vegetable beat and sees another produce-based cookbook in her future. Uses for a dozen vegetable and fruit trimmings typically tossed out by home cooks that find their way into Duggan's dishes. And a tip in advance: Use leaves, fronds, and greens--the parts of a vegetable that tend to wilt quickly--as soon as possible after buying or harvesting. A beet can last for some time in the refrigerator, for instance, but beet greens are at their best when freshly picked. Apple Peels and Cores: Work wonders to infuse bourbon. Who knew? Asparagus Stems: Snap, save, freeze, and then use to make stock for asparagus soup. Broccoli Stalks: Cut off and discard the tough outer peel of the stalk and then shave the remains into paper-thin strips with a vegetable peeler, as Duggan does in her Shaved Broccoli Stalk Salad with Lime and Cotija, featured on the cover of her book. Carrot Tops: Finely chop as a parsley substitute in Italian salsa verde. Taste test for bitterness and use judiciously. Cauliflower Stems and Leaves: Cut into the whole head and through the stem to make cauliflower "steaks," which respond well to caramelizing. Add tender cauliflower leaves at the end. 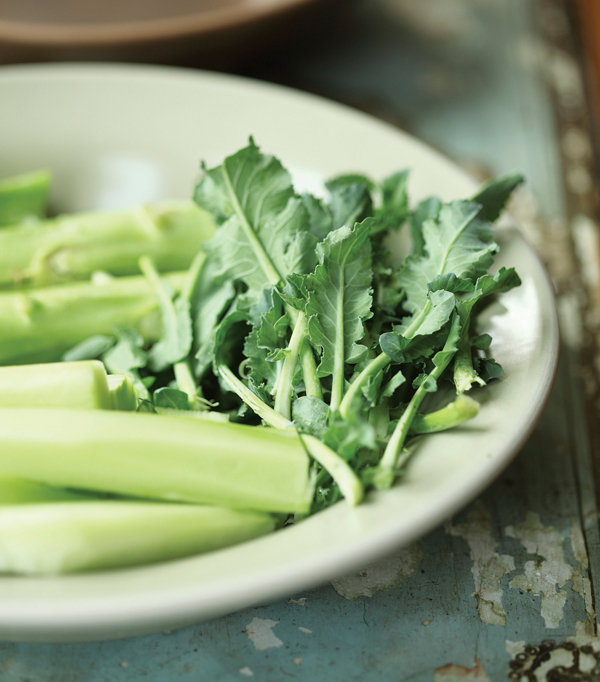 Celery Leaves and Inner Stalks: Add stalks to slaw or use in asparagus soup for an added flavor dimension, mix celery leaves in salad for extra crunch. 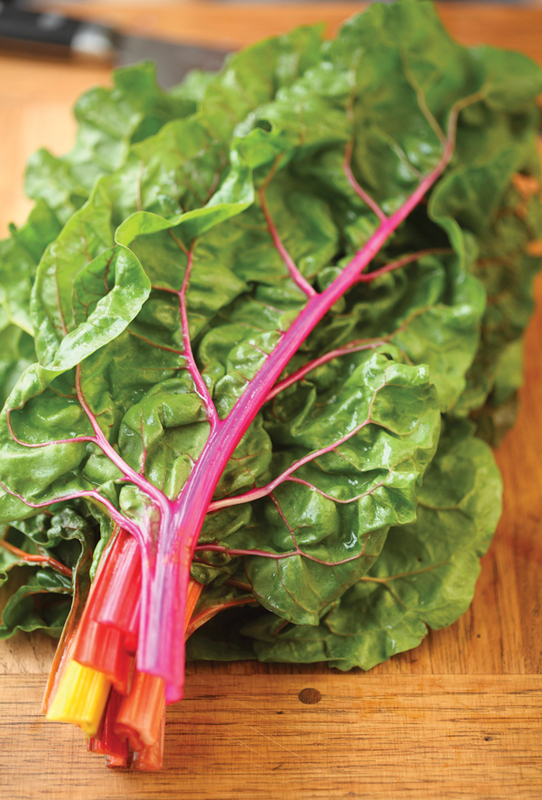 Chard Stalks: Bake stalks with cream, cheese and bread crumbs for a gratin. Pickle them for a crunchy, chutney-like relish or puree for hummus. Fava Beans: Grill them whole until the beans steam through their normally tough outer shells. Toss in olive oil and salt and eat, peels and all. Fennel Stalks: Candy fennel stalks, for a chewy, anise-flavored treat. Fennel stalk syrup fills in nicely for simple syrup in drinks. Lemon Skins: Dry zest then add to vinaigrettes, fruit salads, meat braises, cakes, or anything that benefits from a little citrus boost. Potato Peels: Deep fry, season with salt and paprika. Enjoy. 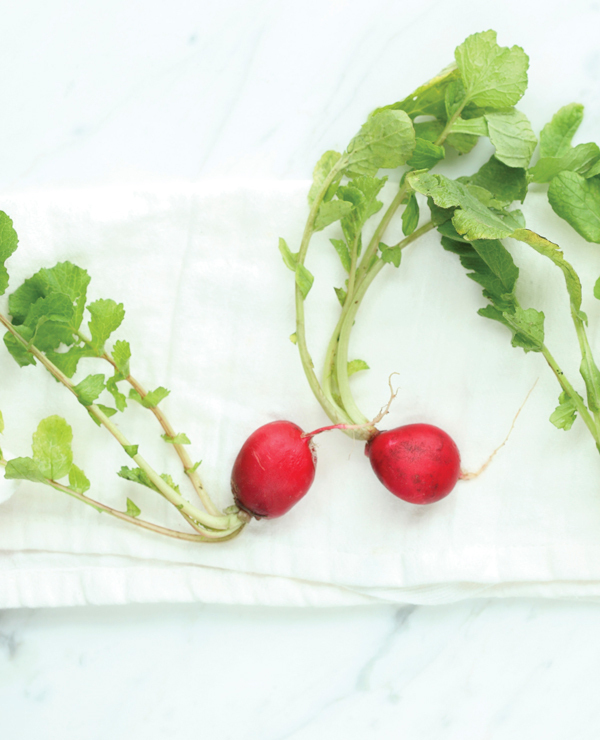 Radish Leaves: Add to salads for a peppery end note. Here is an unexpected use for that half of a watermelon you’re not sure what to do with. 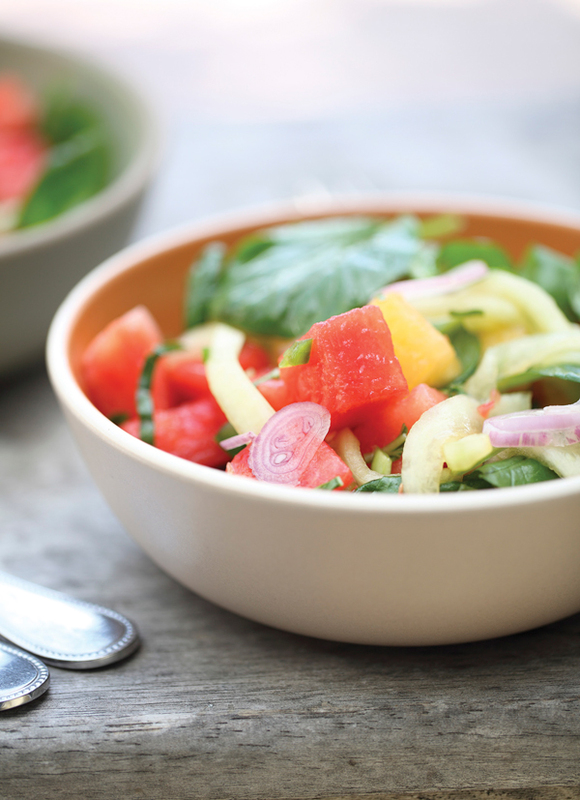 With a flavor profile similar to that of Thai green papaya or banana blossom salad, this recipe takes advantage of crisp, refreshing watermelon rind, which is marinated in a mixture of lemongrass syrup, lime juice, basil, fresh chiles, and fish sauce. After the rind has absorbed all the flavors, you toss it with cubes of fresh watermelon for a juicy dish that I find difficult to stop eating, as the sweet watermelon plays against the savory, spicy, and tart flavors. If you can find mâche, a tender dark green lettuce, it adds beautiful contrasting color and even more juicy crunch to the combination. Note: Most recipes that call for lemongrass only use the bulbous bottom parts, but here you can use the leftover top part of the stalks, or use 2 whole lemongrass stalks. You will have some leftover syrup, which is delicious in cocktails, lemonade, or desserts. To make the lemongrass syrup, place the sugar and water in a small saucepan over medium heat. Cook, stirring, until the sugar dissolves, 2 to 3 minutes. Add the lemongrass stalks, return to a simmer, and cook until the lemongrass flavor is infused into the syrup, 5 to 7 minutes. Let cool, then strain. To make the salad, remove the white rind from the watermelon. Chop the melon flesh into 3⁄4-inch cubes (you should have around 4 cups) and refrigerate until serving. Cut the rind into julienne until you have 2 cups. Place in a small bowl and add 2 tablespoons of the lemongrass syrup, 2 tablespoons of the lime juice, 1 tablespoon of the fish sauce, the shallot, the basil, and half of the serrano. Toss to combine, then cover and marinate, refrigerated, for 1 to 3 hours. To serve, place the cold watermelon cubes in a large bowl and cover with the marinated rind and its juices. Season with the remaining 1 tablespoon lime juice, the remaining 1 teaspoon fish sauce, and the remaining serrano pepper (or to taste). Add the mâche and gently toss. Serve immediately while still very cold. If you eat a lot of broccoli, you can save up the leftover stalks for use in this savory pasta, or use a combination of stalks and florets, which is also a good option if you’d like to double the recipe. Cauliflower works well here too, and chopped black olives, capers, and preserved lemon all make great additions—or substitutions for the anchovies if you want to make a vegetarian version. Bring a large pot of well-salted water to boil. Blanch the broccoli batons, leaves, and florets in the boiling water until crisp-tender, about 3 minutes. Remove with a slotted spoon or skimmer to a plate, then add the pasta to the water and cook to al dente according to the package directions. When done, drain the pasta, reserving 1 cup of the pasta water. Meanwhile, heat 2 tablespoons of the olive oil in a large frying pan over medium heat. Add half of the garlic. When it smells garlicky, after about 30 seconds, add the bread crumbs. Sauté without stirring until the crumbs are browned on the bottom, then stir occasionally until browned and crisp all over, 3 to 5 minutes total. Remove from the pan and set aside. Add the remaining 2 tablespoons of olive oil, the remaining garlic, and the red chile flakes to the pan. When the garlic is fragrant, add the drained broccoli and cook, stirring, until integrated with the sauce, about 2 minutes. Make room in the center of the pan for the anchovies, then add them and crush to form a paste, cooking only about 30 seconds to preserve their flavor. Add the pasta to the pan and stir in enough of the pasta cooking water to form a sauce, then stir over low heat for 2 to 3 minutes. Season with salt and more red chile flakes to taste. Stir in the toasted bread crumbs and serve immediately in pasta bowls with a drizzle of olive oil.